The beautiful town in the Kitzbuhel Alps, St. Johann in Tirol is set in the Leukental valley and surrounded by the Kitzbuheler Horn and Wilder Kaiser range. Summer is the perfect time for hiking mountain biking while the ski pistes in winter are the top destination for skiers and snowboarders. St. Johann in Tirol ski resort is pretty large, there are 172 miles of cross-country ski trails, with 19 lifts and over 23 pistes. 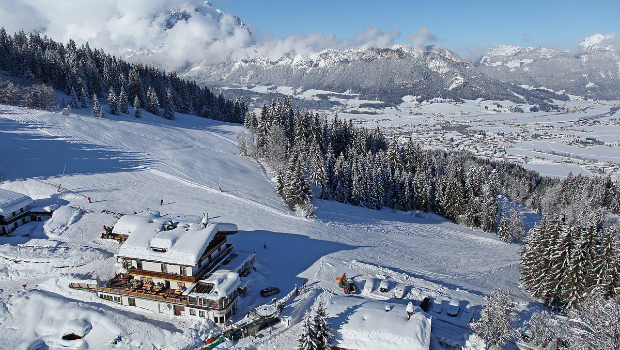 The majority of the pistes at St. Johann in Tirol are covered by snowmaking, there is an excellent network of ski runs. Its ski area is perfectly suitable for families and children due to many easy to intermediate pistes. It is a place best suited to beginner skiers and snowboarders but there is some terrain for both expert and intermediates. St. Johann in Tirol offers skiers an incredible 1030 metres (3379 feet) of vertical descent while the magnificent views of the Baroque village centre and the Wilder Kaiser mountain massif are breathtaking. For snowboarders, there is a terrain park and a half-pipe. Night skiers can enjoy the illuminated ski slopes in Tirol’s largest night ski region. For the fans of Nordic skiing, there is a large cross­country skiing area and walking trails. The yearly held Koasalauf nordic skiing race attracts 2000 starters from 20 nations and is one of the biggest cross­country skiing events in Austria. The open cross­country event takes place in February every year, with the backdrop of the Wilder Kaiser in the region which includes the towns of St. Johann in Tirol, Oberndorf, Kirchdorf and Erpfendorf. For adventurers, there is a 2 km long toboggan in a natural track, while the romantics can enjoy horse carriage rides. Have rest and relaxation after a thrilling day on the snow at the Panorama Badewelt swimming centre. St. Johann Christmas Market takes place on Fridays and Saturdays in the heart of the village centre. Under the amazing Christmas lights, the market features a wide range of festive stalls and gives an opportunity for unique gifts. A host of entertainment throughout the event ensures that everyone is in the festive spirit. Sankt Johann offers the whole year round high-quality hotels, B&B, self­catering apartments, farmhouses and chalets. Most famous hotels in St. Johann in Tirol are Hotel Gasthof Park, Hotel Fischer, Hotel Post and many others. With around 50 restaurants in St. Johann, there is something for everyone. La Rustica, Grander Schupf, Huber Brau are one of the best restaurants in the area. Apres-ski and nightlife are more limited with only a handful of bars. The closest airport to St. Johann in Tirol is Salzburg Airport and the transfer takes about 1.5 hours. Public transport is available and the best way to get to St. Johann in Tirol is by train. There are regular bus lines to the main train station in Salzburg or you can take an airport taxi to get there. The best way to have a comfortable and stress-free journey is by booking a private airport transfer. You can make an online reservation prior to your trip with one of the Salzburg airport transfer providers and get to your accommodation directly. This way you will avoid using multiple transportation types. The taxi driver will be waiting for you at the designated pickup point when your plane lands and in case there are delays, the pickup time will be adjusted, so you don’t have to wait at the airport. The fare for the St. Johann in Tirol taxi transfer is a fixed amount and per vehicle. You have the possibility to book a car, van or bus, according to your needs.